Day 6 of chasing as a guide with Silver Lining Tours (http://www.silverliningtours.com/) took us to the Oklahoma Panhandle. There was a stalled front in place reinforced by an outflow boundary from overnight storms. There was southeast flow at the surface, leading to upslope flow into the Raton Mesa. Instability built to 2,000-3,000 j/kg into this area during the afternoon with middle 60's dewpoints and bulk shear of 55-60 knots. A surface low also developed on the Raton Mesa on the tail end of the front. We initially positioned ourselves near Andrix, Colorado. It took a while, but cumulus towers kept forming right on the low and on the Raton mesa, while a smaller cumulus field was located to the east along the front. 3 storms finally broke through the cap from Andrix to Springfield, Colorado, while another storm rolled off the Raton Mesa to our south, weakened, and then intensified west of Boise City, Oklahoma. We chose this southern storm and headed down Hwy 385 to just north of Boise City, just as the storm produced a wall cloud and became tornado warned. Another storm came up from the south and interfered with our storm, effectively choking off the wall cloud just as it was getting interesting. I really think this storm would have produced a tornado if the southern storm had not interfered. 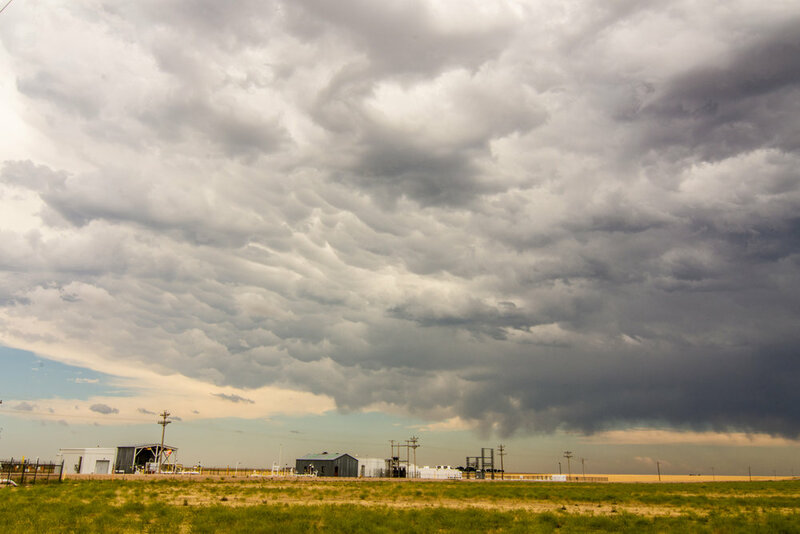 We chased the storm east towards Guymon and eventually to Balko where a tornado was reported. We could not confirm at this point near Balko that it did produce and I seriously question the report as we had a good view of the action area the whole time. Either way, it was a nice storm but turned into a raging mesoscale convective system (MCS) shortly after Balko as storms congealed and got messy. Mammatus under the anvil of the storm to our south near Utleyville, Colorado. We eventually went south and chased this storm. 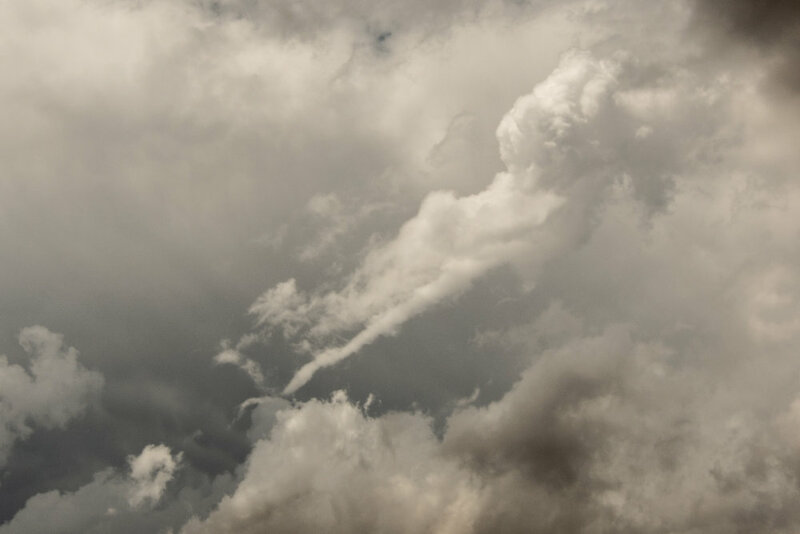 Cool shear funnel out the back of the developing storm near Utleyville, Colorado. Thunderstorms erupting to our northwest as we watched near Utleyville, Colorado. The furthest west storm had an echo top that exploded over 50,000 feet very quickly. Got down to the storm near Boise City, Oklahoma, and this beauty of a wall cloud was there to treat us. Raging hail core to the right (north) side. The storm became tornado warned at this point as the wall cloud began rotating and pulling up focused scud tails into the base. Rear flank downdraft winds coming around the south side that you can notice by the dirt on to the southwest side of the wall cloud as we look due west. 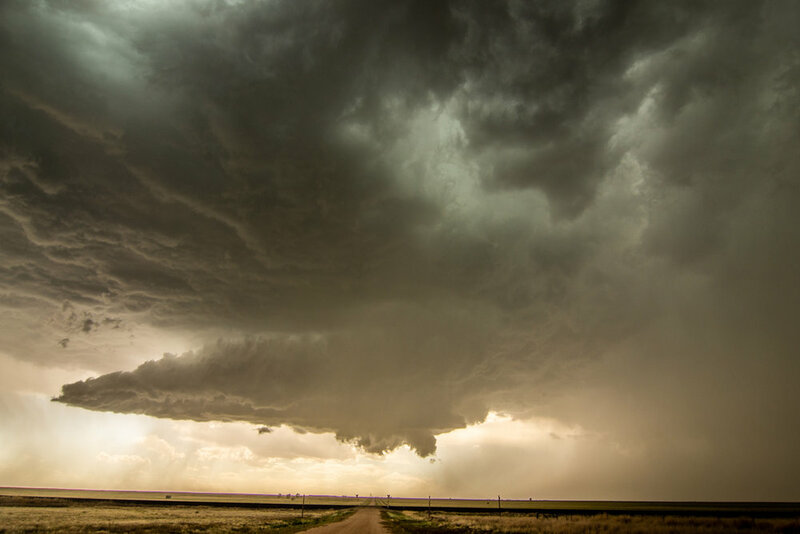 Nicely structured wall cloud that continued to have rotation near Boise City, Oklahoma. This was shortly before the storm to the south came up and interfered. View of the storm near Balko. 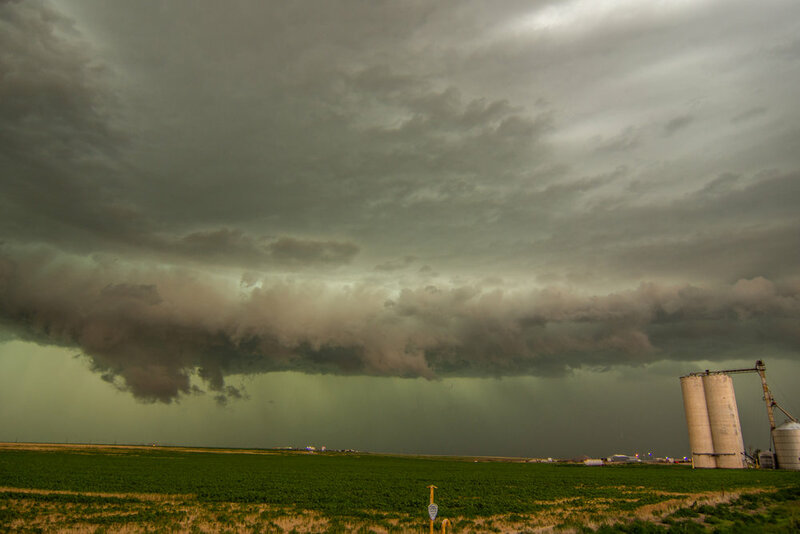 At first glance, this may look like a shelf cloud and an outflow dominant storm, but there was still inflow into the storm here and it became tornado-warned once again due to signs of rotation on radar. Focused area of scud rising into the base on the left side of this image. Mammatus clouds on the back of the storm near Hardesty, Oklahoma. Severe thunderstorm watch issued at 3:30 PM CDT. 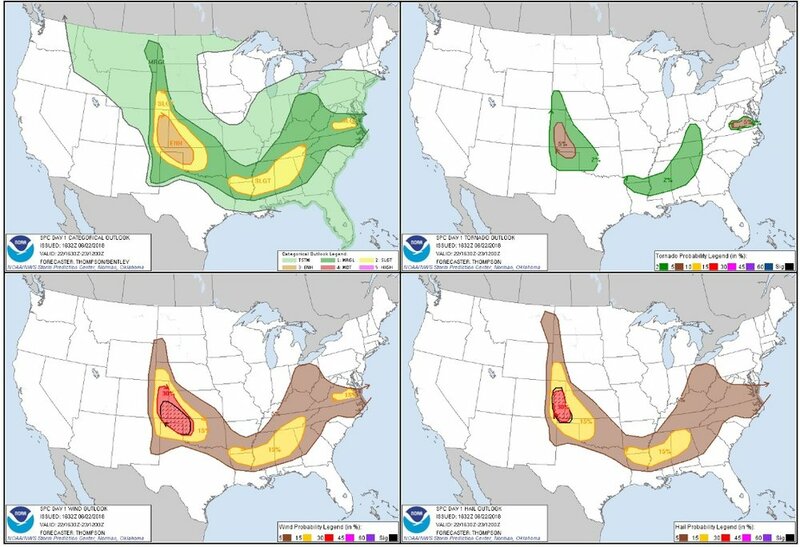 Big threat for severe wind due to the expectations of a severe MCS to develop and track east along the front. Mesoscale discussion issued at 5:14 PM CDT. Bullseye of CAPE increasing to 3,000 j/kg iwth 55-60 knots of bulk shear across the area. Mesoscale discussion issued at 7:12 PM CDT as storms were congealing and forming a severe MCS.